I liked the breakfast every morning. Also, customer service was good and the room was nice and large. I loved the jacuzzi in the bath. Thank you for making our stay a pleasant one. Beautiful property. 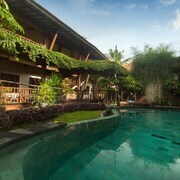 As everyone has mentioned, it’s an oasis of peace in a very convenient area of Ubud. 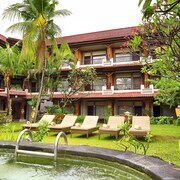 Rooms are large and beautifully furnished. 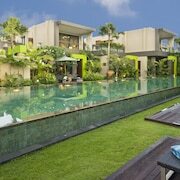 The food and spa were excellent and the staff was uniformly kind and friendly. I totally recommend this property. The room was amazing and the staff were amazing. We really only had 2 complaints. The pool looked kinda green and more like a little pond than a pool For swimming and the wifi was not very good in our room sometimes. About 1/3 of the time. 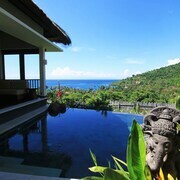 The property was in an excellent location to all amenities and the beach. The staff were excellent and accommodating. 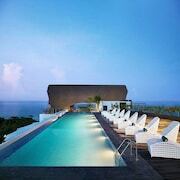 Situated in Gili Trawangan, this hotel is within 1 mi (2 km) of Gili Trawangan Harbor and Gili Trawangan Hill. Gili Meno Harbor is 3 mi (4.8 km) away. 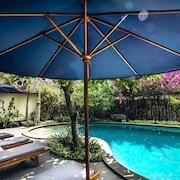 Nestled on the beach, this Gili Air hotel is within 3 mi (5 km) of Gili Air Docks and Gili Meno Harbor. 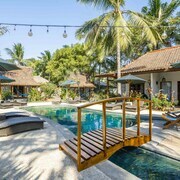 Gili Meno Turtle Sanctuary is 3.1 mi (5 km) away.